“In this searching collection of essays ... Johnson explores ideas of justice, retribution and mercy." “A collection that converses with itself and the reader, asking us to question our beliefs and our roles in a system that perpetuates violence." "[Johnson's] essays on the violence humans inflict on each other and the earth—including racism, misogyny and a variety of pollutions—challenge our culture's expectations of justice and expose the limits of vengeance and mercy." "Johnson writes with palpable compassion and brilliance, illuminating her deep humanity, while imbuing it in equal measure in the people she writes about and quotes. That her influences include Audre Lorde, Simone Weil, Adrienne Rich makes for a clear understanding of what is constitutes the sacred ground on which she stands. Finally, the last essay—”Make way for joy”—actually coaxed a smile and made a wee spot for the possibility of hope in my crankitude. This is no small thing. I am grateful." "This essay collection, which deals with bleeding-edge issues like sexual violence, social justice, and the misuse of power, feels like a necessary read for our times." "In The Reckonings, Johnson takes the extraordinary steps of considering the life of the man who attacked her and reflecting on what should happen to him ... The breadth of topics that Johnson takes on in response to this act of violence in her life is remarkable, and her answers present readers with a profile in courage that deserves wide recognition." "Incredibly timely, this essay collection (in the vein of Rebecca Solnit and Maggie Nelson) seamlessly weaves Johnson’s own thoughts and experiences with philosophy, art, literature, film, mythology and anthropology to tackle questions of justice and retribution, truth and fairness, harassment and assault — and most important, how to translate these feelings into action." "In The Reckonings: Essays, Lacy M. Johnson reflects on justice and retribution and raises difficult questions, all while using own personal experiences with violence and injustice, as well as examples that affect the masses." justice ... Johnson’s questions and answers are hard but necessary." "[Johnson] makes a plea for activism, art, and ... common decency ... [in this] thoughtful and probing collection." 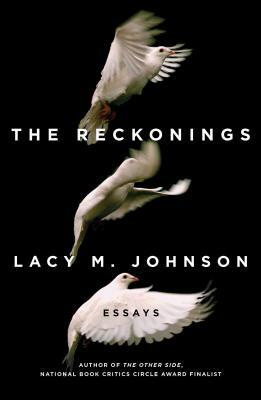 "Through prose that is at once passionate and percussive, Lacy Johnson's The Reckonings demands that we place justice and discovery at the center of our conversations, memories, imaginations, and art. I don't know that I've ever been happier to be alive after reading any book. In this weird way that probably says way too much about the smallness of my life, I felt like everything would be okay -- like we will make and sustain justice -- because a book I needed but never imagined reading was in the world. The Reckonings is as important as it is masterful on the sentence and conceptual level. The Reckonings is proof that caring about this place, and getting lost in the minutiae of what makes us unjust might actually be a pre-req for creating incredible, life-altering, just art." "Lacy M. Johnson's The Reckonings is an essay for thinking people, which, in an age where the essay is reduced at times to "click bait" headlines and recycled advice about dating and wellness, is the highest compliment. Johnson grapples with the fundamental issue of our time: what is justice? What is punishment? What is mercy? Johnson's beautiful writing and hard-won wisdom will make you think, and then think again. I am grateful for this book." "[Johnson's] writing style is engaging and redemptive, a trick accomplished partly by virtue of Johnson’s voice—clear and direct, but with a breezy archness that belies her story’s dark core." "The frankness and eloquence of Johnson's writing puts this true-crime memoir in a league of its own." "Johnson’s memoir is an extraordinary document, and she herself holds an important place in a movement to stop violence against women." "[Johnson's] direct and honest prose not only evokes empathy, but an incendiary anger." "The Other Side is neither flowery nor stale, never shy or gratuitous. Instead, its haunting beauty grips the reader from the opening line ... Unforgettable." "[Johnson writes] with both fury and restraint. The reader feels pulled onto a fast train, in a compartment with a narrator telling an intimate and terrifying tale."